Your glasses are important to you. Many people rely on their eyewear for safety and clarity throughout everyday activities. Many people's livelihood depends upon the upkeep of their eyeglasses. Here at BLUPOND, we have got you covered. Invest, With your utmost satisfaction in mind, we have designed a stylish, complete glasses case package, built to last, to accommodate nearly any and all of your eyewear. Designed to fit almost any size glasses; use the internal dimensions provided for reference. 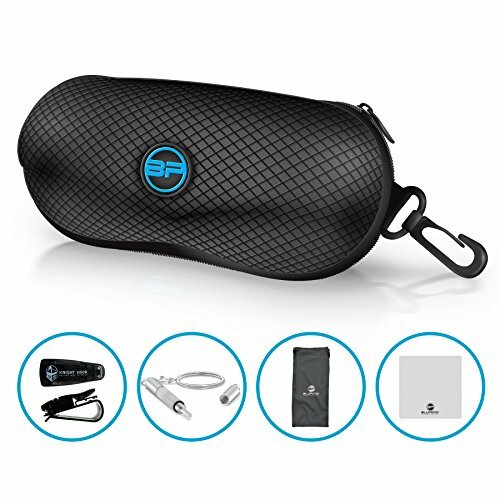 From sports / driving sunglasses, to reading glasses, BLUPOND's hard EVA protective carrying case is sure to be your perfect eyewear companion.BLUPOND EVA CASE DIMENSIONS:Interior: Length 149mm Width 62mm Height 50mm, Exterior: length: 171mm width: 83mm height: 60mm. 100% Satisfaction Guaranteed. Try risk free. Click "Add to Cart" now to claim your glasses at a Discounted Price! PROTECT YOUR GLASSES ON THE GO, WHEREVER YOU GO - Be Safe and Ready in today's fast-paced lifestyle, with BLUPOND's protective glasses case. Extremely durable, to safeguard your eyewear from inevitable drops or dings, BLUPOND's protective eyeglasses case is made from EVA foam, a soft yet durable polymer of ethylene and vinyl acetate, commonly used in sports equipment. This intelligent design gives your eyewear the strength and durability you require, within a case that is guaranteed to last. STYLISH DESIGN MAKES A GREAT GIFT FOR MEN, WOMEN, & CHILDREN - Stylishly designed in all black, Light Blue and Pink, BLUPOND's sleek and sporty EVA hard glasses carrying case is made perfectly to fit nearly any size eyewear, for anyone in your family. Equipped with belt loops clip/carabiner/closure. Constructed with secure, yet easy-to-access hinges, BLUPOND's protective glasses case makes the perfect gift! BLUPOND's glasses case interior dimensions - Length: 149mm; Width: 62mm; Height: 46mm. CONVENIENT FUNCTIONALITY AND PORTABILITY FOR EVERYDAY USE - Designed to accommodate nearly any and all eyeglasses, reading glasses, and sports / driving sunglasses, BLUPOND's hard EVA glasses case is truly your all-in-one eyewear case solution. Simply carry the included Microfiber Cloth alongside your eyewear, within the case, for added lens protection. Complete with a convenient, matching Hanging hook, you'll be sure to have your eyewear handy at all times, without fear of misplacing them. A BUNDLE AT A BARGAIN - This high-value set comes with everything you need to keep your eyewear safe at all times. No more hassle picking up each item your glasses need; BLUPOND has you covered! Complete with a universal Car Clip Holder, for added convenience. Keep your eyeglasses clean and clear with our Microfiber Cloth, and safe and secure with our Carrying Pouch. Make minor adjustments to your glasses with our Mini Screwdriver. All of this comes complete with your BLUPOND hard EVA case. BLUPOND EVA CASE DIMENSIONS:Interior: Length 149mm Width 62mm Height 50mm, Exterior: length: 171mm width: 83mm height: 60mm. Our products are designed to last, and customer satisfaction is our First Priority, here at BLUPOND. In the event of any problems, please contact us directly and we promise to resolve any issues as quickly as possible.